The sequel to the extremely popular strategy game, Kohan: Immortal Sovereigns has finally arrived on the PC that once again brings gamers into the amazing and rich world of Khaldum that is once again savaged by the tides of war. The storyline is set quite a few years after the turbulent ending of the original game and once again it is up to Naava and the mysterious immortal race known as Kohan to assist the remnants of humanity in order to vanish this ancient evil that has returned. Although the storyline is rather clich�d when compared to other fantasy storylines, it is actually quite compelling and does help immerse the gamer into this land of sword and sorcery. 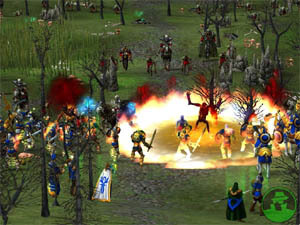 Kohan II: Kings of War offers the gamer over 25 unique missions that contains various scenarios and settings to ensure that the player doesn't become too content or bored within the lands of Khaldun. For the more professional real time strategy (RTS) gamer, the title should easily be completed in around 20 hours with the more novice gamer taking around 30 or more hours to successfully complete this game. As with all RTS fantasy games, the player has the choice of playing a variety of races that include human, haroun, drauga, gauri, the undead and the shadows. As per usual, each of the races has their own unique attributes that affect how the game is played which range from basic economics to their own unique military units that really sets this apart from other titles of the same genre because of the diversity of each of the races. Probably one of the most enjoyable differences of this game is that the title isn't just a scavenger hunt for resources (e.g. crystals, wood or iron) but rather certain buildings such as mines automatically accumulate these resources with the player only responsible for mining gold. This is a brilliant idea that helps assist in the "boring" aspects of economics and ensures that player can spend more time in battles or mastering their own personal tactics. Another difference of Kohan II is that units are grouped into companies that also gives the gamer a variety of combat options that affects movement and combat. This management system is ideal for engaging in huge battles that are quite common during the second half of the game, so you don't have to worry about individual units as your units now work as a team. Kohan II also lets you mix and match your companies so you should include a variety of different units in your groups that include healers, swordsmen or mages that all work hand-in-hand to ensure the best possible combat tactics. For example, the mages will attack the creatures in the distance with the swordsmen attacking their closest opponents. The only units that are controlled individually are the heroes who also gain experience (as do the companies) and also have the option of levelling up to make them quite efficient units. That said, units that have levelled up can also become quite powerful killing machines, especially when you have a well mixed company. Last but not least, Kohan II also offers the gamer a variety of gameplay modes that includes (single-player, skirmish and multiplayer modes that include LAN and the internet.) 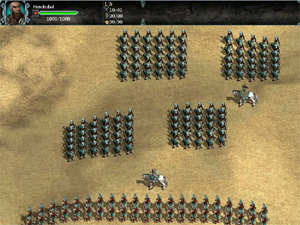 It should also be mentioned that the AI can sometimes be quite annoying because of their advanced scripts that you can almost be forgiven in thinking that you are playing a human unit but as with most RTS games, once you have figured our their strategies, you can create your own counter offensives. Graphically, Kohan II is indeed a very nice looking game that combines the 3D engine flawlessly into the RTS environment. All the units are animated extremely well and contain a fairly high polygon count for that extra realism and add some amazing special effects and you have one impressive looking title. Easily the most impressive feature of the game are the amazing spells that the powerful wizards of Khaldun wield and one can only be impressed when they summon the mighty meteors down from the heavens. The audio quality of Kohan II also lives up to the same expectations of the graphics with professional voice acting, an engaging musical score and a plethora of sound effects that appear to have been taken from a Hollywood fantasy blockbuster like the Lord of the Rings. In conclusion, Kohan II: Kings of War isn't your average fantasy RTS but offers the gamers a variety of new options that really adds something to this genre. With amazing graphics, a very concise and playable game system with a rather interesting storyline, you'd be hard pressed to find another game as enjoyable as Kohan II... best check this one out if you are a RTS fan!